I have just returned from a cycling trip from Bangkok to Yangon. It was pretty hot. My bike computer (Garmin Edge 1000) read 44.7C (112.5F) at one point. I was able to download the data it had collected. As I was not the only person on the trip who wanted to analyse the data, I thought I’d just process the .gpx file and produce a .csv file for general consumption. But given I always have to look up how to do various data manipulations, I thought I would write up what I have done so that I can reference it in the future. Here’s a chart showing the temparuture for one day cycling in Thailand. And here’s another showing the temperature for one day cycling in Myanmar. First a lot of imports. One day we will have a single import for all the libraries needed to do R-like data analysis. 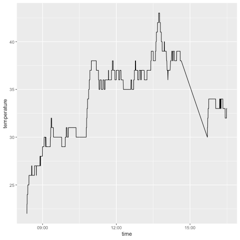 We want to create records of the position, time of day and temperature that can be written using the Frames package. 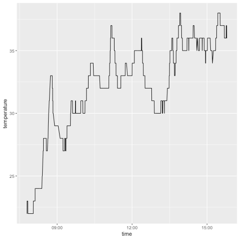 The elevation, time and temperature are children of the “trkpt” node. The position on the other hand is an attribute of the “trkpt” node. The date and time seem to use this format. We’ll save it and also provide it to R for plotting using another format (why not?). > tFormatR = "%Y-%m-%d %H:%M:%S"
Attributes are returned as a HashMap. Create a record using and for use in the Frames package. >               Nothing -> error "Failed to parse time"
Finally we can take the input and parse it into a list of records. > preCSVs = map h . catMaybes . map g .
And with this we can now do some analysis. >   analyseGpx "data/activity_3457805023.gpx" "diagrams/temperature.png" "Burma.csv"
>   analyseGpx "data/activity_3439353899.gpx" "diagrams/temperature1.png" "Burma1.csv"